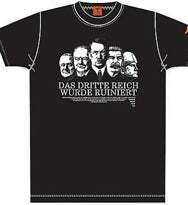 If you thought Wii was a marketing blunder, welcome to the world of Sega, which has emblazoned Adolf Hitler on promo T-shirts for its WWII 'Advanced Dai Sen Ryaku' (Advanced Big Strategy) game. This, on the 60th anniversary of the Tokyo war crimes trials. Is it possible to score two own goals at once? Sega expects people to pay for the shirts. But whatever you do, gamers, don't wear one when attending the World Cup in Germany. You'll likely be arrested by the police, or suffer something worse by others. Dan's Thoughts: What, no babydoll version?